Small World: Cursed! is a mini-expansion to the game Small World that adds a few new races and a few new powers. Much like Grand Dames, “mini” is definitely an accurate description—this expansion is essentially the punchboards with the races, their tokens, and the special powers wrapped in a paper sleeve. (Also like Grand Dames, it’s so small it was hard to find on the shelf of my FLGS. Be warned.) Fortunately, it also comes at a mini-price of only $10 (and if you look you can find it discounted even further). Is Cursed! worth it? I think so. Cursed! is my favorite of the additional-race expansion packs so far. It adds two new races—Kobolds and Goblins—and five new special powers. 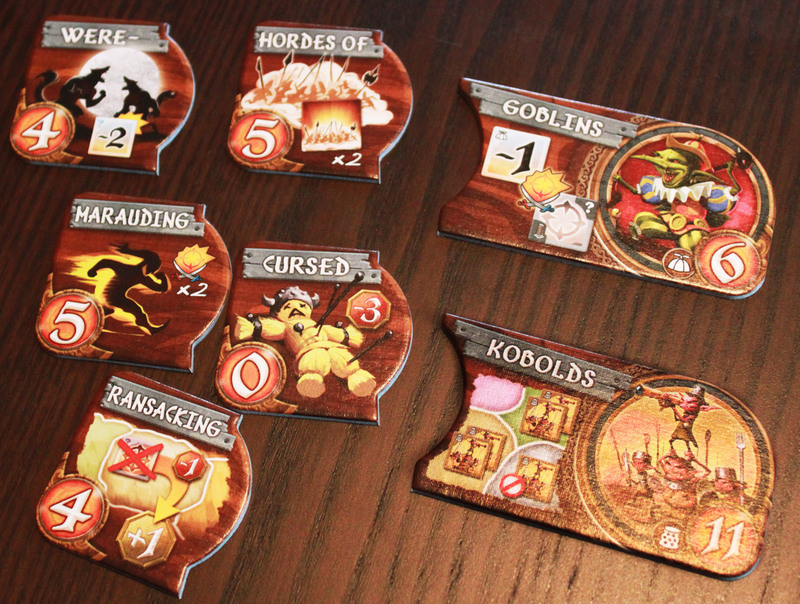 The new races are fine—Kobolds flood the world with a huge number of tokens but need two to hold on to a region, while Goblins conquer in-decline races with one less token. My favorite part of Cursed!, though, is the new set of powers, which I think are delightful. The simplest, “Hordes Of,” just adds two extra tokens to your army. But then you have “Marauding,” which lets you go through the conquest cycle twice. “Ransacking” one-ups “Pillaging” by taking one coin from your opponent when you conquer a region containing their active race. “Were-” lets you conquer all regions with two less tokens, but only at “night”—even-numbered game turns—while doing nothing during the day. And finally, perhaps my favorite, “Cursed,” which gives no extra ability and no additional tokens, but you have to pay three coins instead of one to pass it up. The brilliance there is that no one wants to take such a limited race, but eventually, after enough people have passed it up, it becomes so extremely valuable with all the coinage stacking up. I once scored eighteen points just by taking the “Cursed” race. Cursed! also includes an extra blank race banner and power badge, so if you like making up your own stuff, you have yet another opportunity here. This expansion doesn’t change the gameplay in any significant way; it offers new strategies you can use with these new races and powers. But the new powers are delightful and just add more variety to an already wild selection of races and powers, and I really enjoy the addition. Especially because it’s so cheap, it’s worth adding in to your collection if you love Small World.